Hi there! 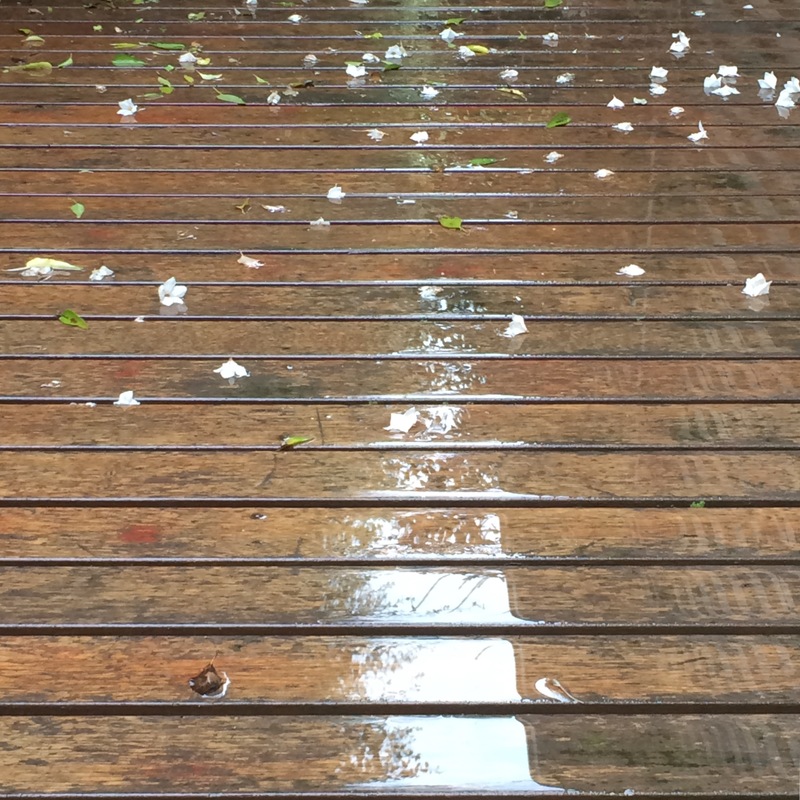 Well, it’s been a funny old weather week in Melbourne! We had a gorgeous spring day on Tuesday but aside from that we have seen quite a bit of rain and wind. It’s pretty much kept me indoors, puddling around – what a pun! – doing homey things. Which isn’t all bad. It’s nice to have a quiet week, isn’t it? When we were out on our morning walk on Tuesday, – the nice day! – we spied this lovely lady. 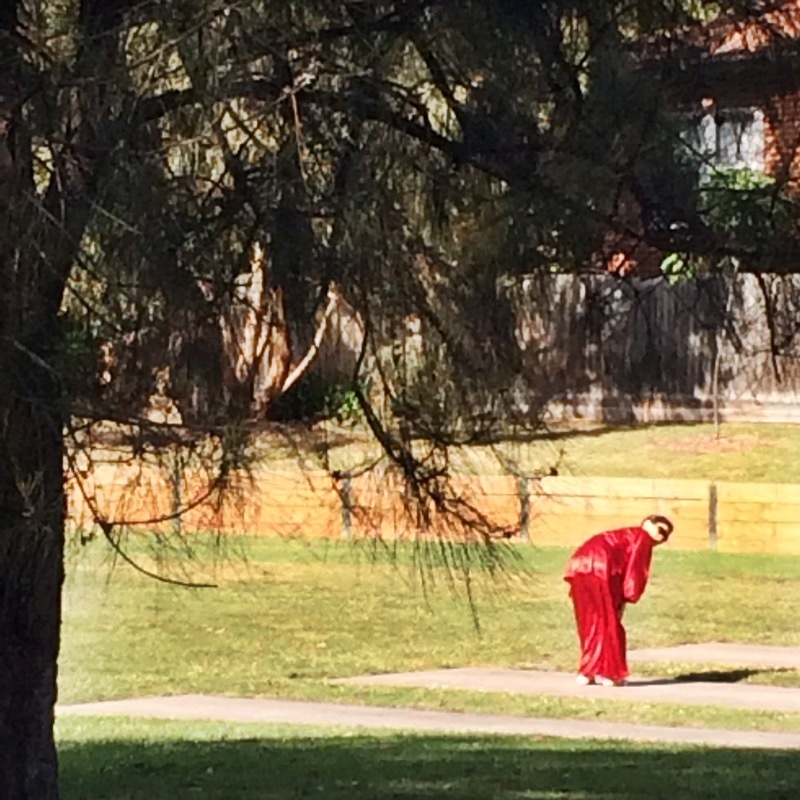 There she was, decked out in silky red pyjamas, diamanté clip in her hair, sunnies on, preparing herself for tai chi. I tried to take her photo a little surreptitiously but just as I was about to take the snap, she turned in my direction. Felt a bit awkward! Hope she wasn’t offended! During the week my man cooked his specialty – also known as the only meal in his repertoire! – chicken parmagiana. So nice when I don’t have to cook dinner! He likes to serve potatoes with dollops of sour cream and snipped chives as an accompaniment. Yep, he’s pretty fancy, my man! I needed to do some baking the next day so decided to combine the left over sour cream with lemon to make some cookies. I do love a lemon/sour cream recipe combo! I used this recipe and, I have to say, they have gone down a treat! 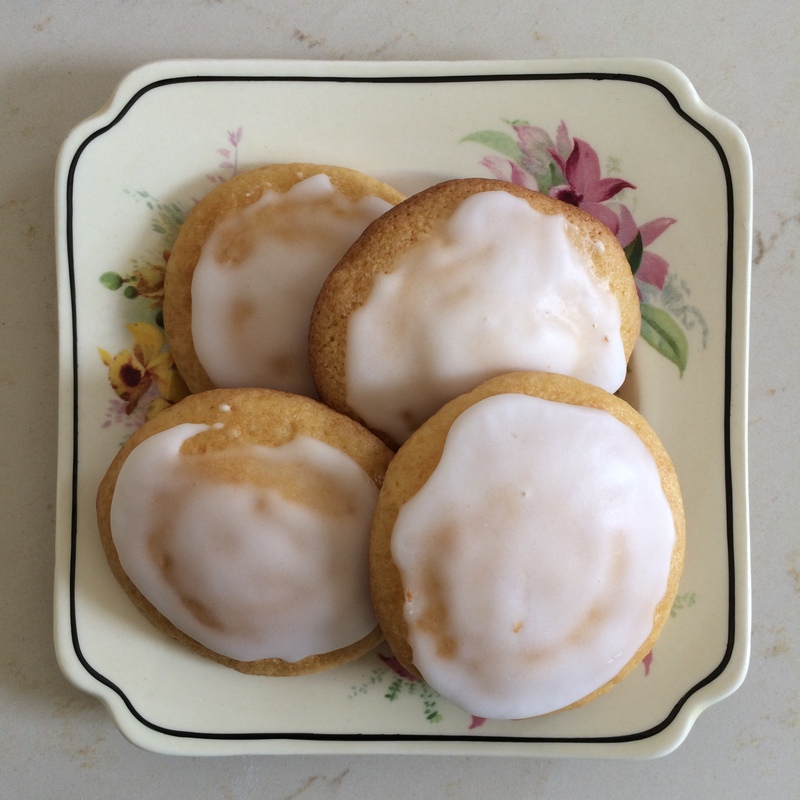 They’re not a crispy cookie, more cakey in texture, like the base in jaffa cakes. I deviated from the recipe a little bit and topped mine with a smear of a simple lemon glaze. I’ve been joining in with the tinkersketch challenge this month. I like to keep up a regular drawing practice but I find it a bit tricky sometimes to think about what to draw. My mind draws a blank! Haha! Such a wit! Having daily prompts from someone else helps to keep me motivated. Is there a creative pursuit you try to practise daily? Are you a ‘challenge’ person? I quite like this one that I did for the day five prompt ‘drip’. Probably also could have drawn one inspired by the rain that kept drip, drip, dripping outside! And what do you do when it’s like this outside and you have painters in your kitchen? Can’t bake, can’t cook, can’t get out for a walk or do some gardening – not that I’m mourning the last option! I caught up on a couple of podcasts and a little bit of TV viewing whilst doing some knitting.. Carly drew my attention to this podcast which was a great chat between Wil Anderson and Annabel Crabb. Lots of interesting stuff about their lives in journalism, feminism, politics, school life. Really excellent. And I listened to more Annabel on the birthday edition of Chat 10 Looks 3. I loved Leigh’s rewording of Tim Minchin’s song ‘When I Grow Up’. That has to be one of my favourite songs. Very poignant, very Tim. Did have a little tear up when Leigh played the original version! Equally poignant is Josh Thomas’s show Please Like Me. His writing is so great. I love the way he can capture the comedic, angsty, vulnerable moments of life all in one little episode. The characters are all so beautifully portrayed. Very natural, very relatable. Is there a TV show that touches your heart? Sunny days ahead are promised so I’m looking forward to stretching my legs a bit more this week. Has your week been out and about or a bit more housebound? Pop over to Isabel’s blog to see what others have been up to. Next > Are you a library lover? She was in full swing tai chi mode on our return trip but I felt way to sheepish by that stage to try for the action shot! Baking for me this arvo will be a batch of Anzacs. It did sound like an interesting book, didn’t it? I’ve also put The Wife Drought on my reading list. Think I might be seeing Matilda again when it comes to Melbourne. There’s just so much coming out at the moment. Waitlisted for Kinkiy Boots at my girl’s insistence, and Book of Mormon. And the. There’s Singin’ in the Rain and Fidfler on the Roof with my fave, Anthony Warlow and some great MTC stuff too…Anzacs just out of the oven. I have a lovely warm spring breeze and baking smell combo wafting through the house! I love your sketch. What a gorgeous picture. 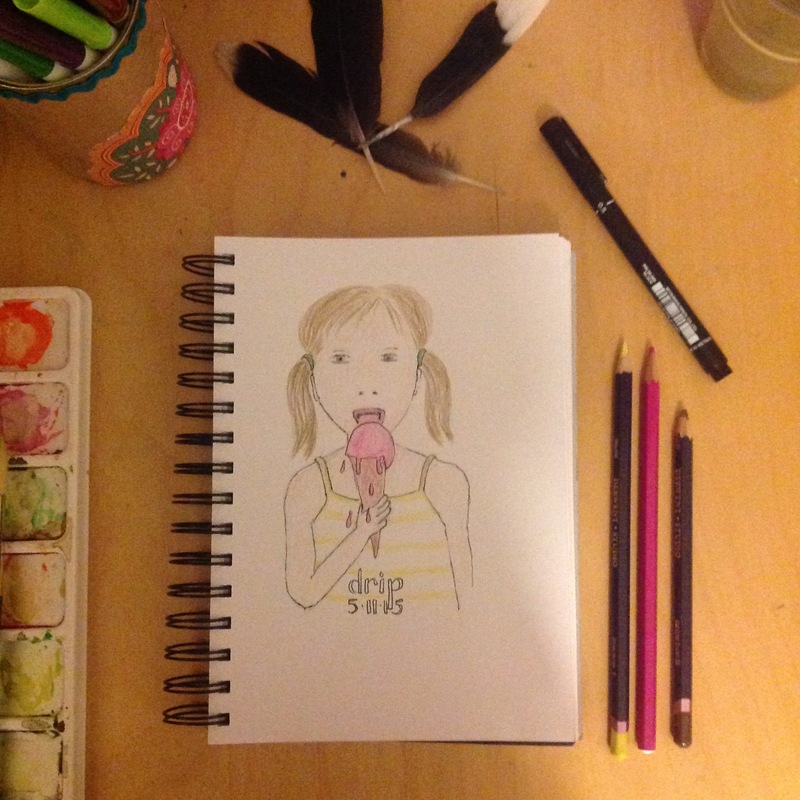 I love this idea of a sketch prompt – I’m going to link through, thanks for sharing that. Just on creative daily stuff – I write Morning Pages. You are meant to do it every day but I often get caught out on the weekends with the kid’s early morning sport. But I do it most days during the week and recently I’ve been combining a bit of ‘gratitude’ stuff in to it, so I start by listing a few things that I am thankful for and then I do my ‘free’ writing. It helps clear the way for other things, and it helps me ‘talk out’ things that are bothering me or that I can’t work out a solution for. Sometimes it just helps me plan my day. But it’s great! Oh yes Morning Pages are great. An excellent way to clear the head and sort thoughts. I would like to discipline myself to commit to them more regularly. Sometimes that extra bit of time in bed is just too enticing! Thanks for your comment! I’ll have to have a look at that challenge too! Sometimes you just need someone else to help you find your spark, don’t you? I always feel a bit empty if i haven’t created something – even if it’s just baking a batch of biscuits.thanks for stopping by! Oh yum, those cookies look lovely! I like the drips too, both pics. I am also doing Tinkersketch so I know what you mean, sometimes the blank page just stares back at you! If you are going to wear diamanté and red silk, attention will find you, I am sure the lady was just sad she didn’t get to pose!! I wish I’d been able to get more of an action shot of her but when you’re working in the sly, you take what you can get! Like those cookies Carolyn….I like seeing your sketches on IG, wish I could draw, although I am trying my hand at Calligraphy . Thank, Mauara. I’m enjoying your crochet!